Morpeth won the Evo-Stik NPL East Division on Saturday when they defeated nearest challengers Pontefract Collieries at Craik Park on Saturday. Goals from Sean Taylor, Joe Walton and Jack Foalle won the game for Morpeth after Michael Dunn had fired the visitors into an early lead. 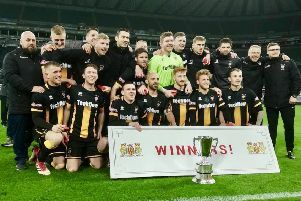 It gave the Highwaymen a league and cup double, with four games to spare, after they beat North Shields in the final of the Northumberland Senior Cup the previous Tuesday. Pontefract arrived at Craik Park, knowing victory was imperative to keeping the title race and they couldn’t have wished for a better start when taking the lead on 3 minutes. Conner Smythe whipped in a low corner that was met by Michael Dunn and he drove a first time effort beyond the dive of Dan Lowson. It wasn’t the start that Morpeth had envisaged and looked to strike back immediately. Jack Foalle saw his effort headed off the line by Jack Greenhough for a corner. Whilst the initial corner was deflected behind for a second, it was from the second that Morpeth almost levelled. Ben Sayer curled the ball in and Michael Turner arrived but saw his header clip the top of the bar and go over. The Colls were more than matching their hosts and had a chance to double their lead on 24 minutes. Nicholas Guest tried an ambitious volley from the corner of the penalty area but it bounced once and into the arms of Lowson. The Highwaymen pulled themselves level courtesy of their leading scorer this season, Sean Taylor. David Carson and Joe Walton cut open the defence and it was the latter who crossed for Taylor to volley home inside the box. Both sides had a chance to take the lead into the interval. Walton reached the ball ahead of the ‘keeper Musselwhite but could only hook his shot wide. Dunn had a better opportunity for the visitors when he got clean through but could only toe poke an effort at Lowson. Morpeth took the lead on the hour mark and it was Walton who got the goal. The Colls defence could only clear the ball as far of the 18yd box and Walton volleyed the ball home through a crowd of bodies giving Musselwhite no chance. Seven minutes later and Taylor looked to grab his second of the game. A poor pass from Greenhough was seized upon by Taylor and he played the ball over the head of the ‘keeper but it unfortunately cleared the bar as well. On 74 minutes, there were muted penalty appeals from the visitors who wanted a handball decision against Chris Reid but the referee rightly ignored the appeals. Morpeth capitalised on this and added their third goal on 75 minutes. Carson split the defence with a fantastic ball and Foalle sprinted clear of Spencer Clarke before rounding Musselwhite and slotting home. The visitors kept battling and after Clarke had kept the ball alive at the far post, it fell to Vaughan Redford who volleyed high over the bar from the penalty spot.